The Vivian Olum Child Development Center began in 1990 as the Young Children’s Center, a collaboration of the Parent and Child Education program, an early intervention program of the University of Oregon’s Center on Human Development and Human Resources. With the completion of the new building in 1996 the Vivian Olum Child Development Center was established, a program of University of Oregon Human Resources. In February 2018, the Vivian Olum Child Development Center became a unit within the campus services group reporting into the Office of the Vice President for Finance and Administration. The center is funded by a combination of parent fees and university support. 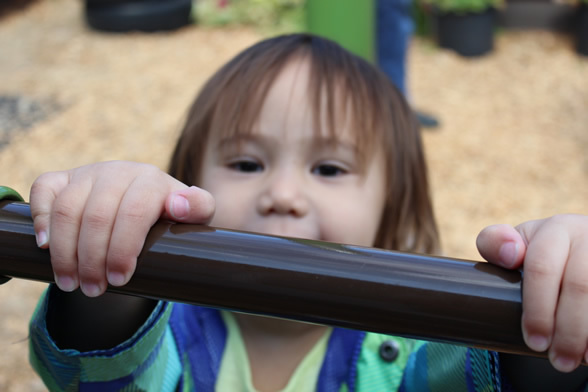 The Vivian Olum Child Development Center is the culmination of many years of work by members of the university community shaped by the vision of Dr. Paul Olum, president emeritus of the University of Oregon. Dr. Olum provided a large share of funding for building phase one of the center in honor of his late wife, Dr. Vivian Olum, UO associate Professor of Counseling Psychology, whose professional activities and research focused on helping children and families. The center is named in her memory. "She had a gift for helping children feel safe and creating an environment where they could heal," says Eugene psychologist Charlotte Peterson, who studied under Dr. Olum. "It was a joy to watch her work with children." The Vivian Olum Child Development Center is a community where children are nourished, parents are welcomed, and care givers feel valued. The mission of the Vivian Olum Child Development Center is to provide comprehensive high quality programs of early childhood and school-age care and development for the children of University faculty and staff. The center provides faculty and students interested in the development of young children a setting for observation, participation, and research. Our goals include providing a foundation of experiences that foster growth and development of children and a safe and nurturing environment for children and families.